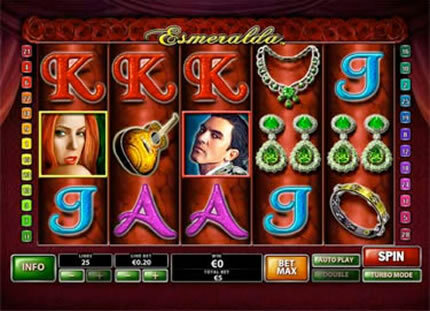 Fly Casino is pleased to present Esmeralda. This new game offers our members a multi-level progressive system. Bet a little or bet a lot, either way you can win a HUGE progressive jackpot at Fly Casino. The scatter symbol is an elegant Rose. Get 8 or more scatters will win you a small cash prize plus up to 70 free spins that can re-trigger during your bonus feature! Saturday July 26, 2014 00:00GMT until 23:59GMT on your first deposit of $/£/€10 or more our members are eligible for our exciting Your Choice bonus. 2X Super Value Monday! On Monday July 28, 2014 from 00:00GMT until 23:59 GMT, all members on their first deposit of $/£/€40 or more will receive a $/£/€60 bonus. Claim it 2X for 120.00. On Tuesday July 29, 2014 from 00:00GMT until 23:59 GMT, all members on their first deposit of $/£/€75 or more will receive a 130% deposit bonus up to $/£/€260.00.